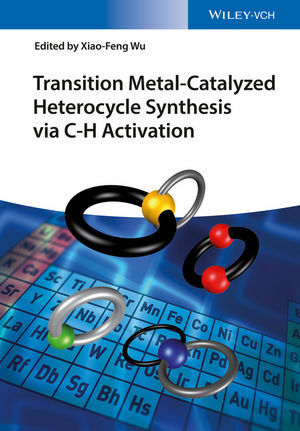 Reflecting the tremendous growth of this hot topic in recent years, this book covers C-H activation with a focus on heterocycle synthesis. As such, the text provides general mechanistic aspects and gives a comprehensive overview of catalytic reactions in the presence of palladium, rhodium, ruthenium, copper, iron, cobalt, and iridium. The chapters are organized according to the transition metal used and sub-divided by type of heterocycle formed to enable quick access to the synthetic route needed. Chapters on carbonylative synthesis of heterocycles and the application of C-H activation methodology to the synthesis of natural products are also included. Written by an outstanding team of authors, this is a valuable reference for researchers in academia and industry working in the field of organic synthesis, catalysis, natural product synthesis, pharmaceutical chemistry, and crop protection. Xiao-Feng Wu is Professor at Zhejiang Sci-Tech University (ZSTU) in China and also leads a research group at the Leibniz-Institute for Catalysis in Rostock (Germany). He studied chemistry at ZSTU, where he obtained his bachelor's degree in science in 2007. In the same year, he went to Université de Rennes 1 (France) to work with Prof. C. Darcel. He obtained his master's degree there in 2009 and then joined the group of Prof. M. Beller at the Leibniz-Institute for Catalysis in Rostock. He completed his PhD thesis in January 2012 and was promoted to Full Professor at ZSTU in 2013. His research interests include carbonylation reactions, heterocycles synthesis, and the catalytic application of cheap metals. He has already authored 5 books, 15 chapters and >120 publications in international journals. He also was a fellow of the Max-Buchner-Forschungsstiftung.